The piece “Eye on Malawi’s EITI: EITI in Malawi’s Neighbouring Countries” featured below was initially published in Malawi’s Mining Review Issue Number 23 2015 that is circulating this March 2015. 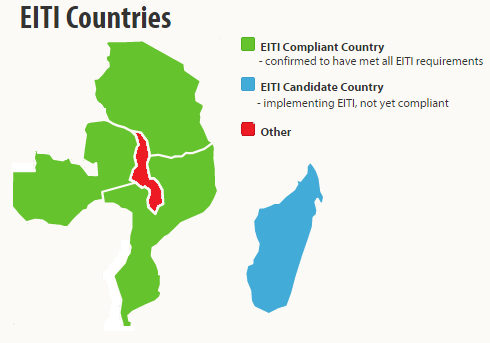 Malawi’s neighbours, Mozambique, Tanzania and Zambia, are already EITI Compliant. Malawi is an island, surrounded by countries that have signed-up to, passed the candidacy stage of and complied with the Extractive Industries Transparency Initiative (EITI). Malawi’s neighbours – Tanzania, Mozambique and Zambia – were declared compliant by the EITI Board three years ago in 2012. The move to join the voluntary initiative was taken by these countries to ensure the extraction of minerals contributes to their national socio-economic development. The multi-stakeholder groups in the three countries have guided the publishing of reports which allow citizens to follow the value and price paid for the country’s natural resources, from production until the money reaches government coffers. Companies report payments to government (including taxes and royalties) and the government reports what it has received. An independent administrator, usually an auditing firm, reconciles these figures, compares the data sets, and investigates and explains any discrepancies between company and government reporting. This is published in the EITI report. To date, Tanzania has produced four reports, Mozambique has produced five reports and Zambia has produced six reports and in each country the number of companies included in the process has risen. The information from these reports is used to stimulate debate among citizens and provides evidence for policy makers in determining the best fiscal regimes for oil, gas and mining in their countries. the Southern Province Permanent Secretary Margaret Miyoba said, according to the Lusaka Voice, at the launch of the Zambia’s fourth EITI Reconciliation Report last year. To follow its neighbours, Malawi’s EITI process will be guided by the multi-stakeholder group, described in last month’s column. Representatives from government, industry and civil society who will form this group have now been confirmed. As explained in last month’s column, government representatives will come from the Ministry of Finance, Economic Planning and Development, which is leading EITI implementation, the Ministry of Natural Resources, Energy and Mining, the Reserve Bank of Malawi, and the National Audit Office. ActionAid Malawi, the Catholic Commission for Justice and Peace, Citizens for Justice, and the Foundation for Community Support Services were chosen in December 2014 through the Natural Resources Justice Network to represent civil society. This month, the private sector announced its representatives: Bwanje Cement, Globe Metals & Mining, Mkango Resources and Paladin. We await the first meeting of the group.